Reader Zeta Metal sent this my way, and it's just so bizarre that I had to share here. 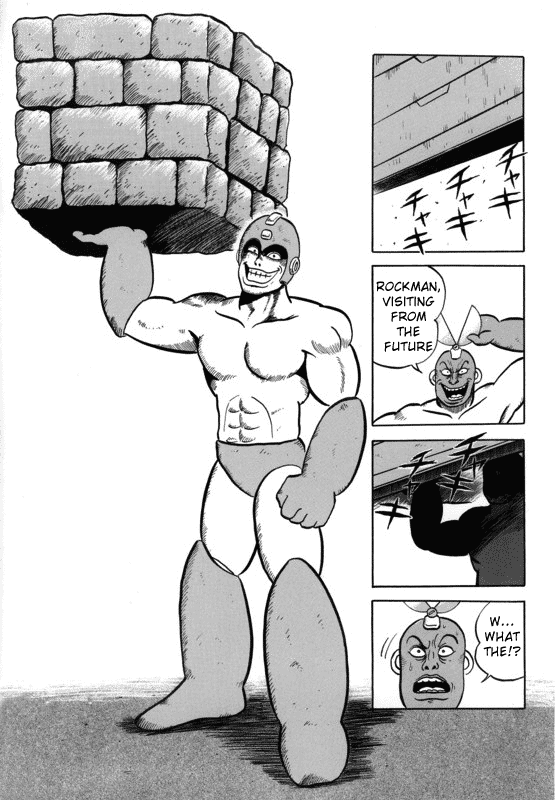 Prior to his death in 2006, Ken Ishikawa, co-creator of the famous Getter Robo series, drew a parody comic based off of the events of Rockman 1. The short one-shot is popular in Japan for its strange and subtly disturbing depiction of the classic series cast; primarily a maniacal Rockman who's hell-bent on defeating everyone that stands in his path in the most vicious manner possible. The story takes a turn to the weird when Rockman assimilates himself with all nearby matter, transforming into an ominous giant as he prepares to confront Wily. It's a story that has to be seen to be believed, and thankfully, there's an English translation. The strip was finally translated a couple years back thanks to the efforts of Ishikawa's loyal fanbase. The dialog is a bit wonky in some areas, but its supposed to be intentional to coincide with the story's madness. Download it here! Wat has been seen cannot be unseen. I can't download it. It says the file is not found. Yeah, and that was the cause of his death!! There's multiple mirrors in the provided link. Try the Rapidshare one, works best for me. @Kotipeltox: And you really need to respect people more. This parody looks great, something that more things in the world could use. Holy crap, this is creepy. o_o Probably the creepiest thing I've ever seen. I know this isn't anything related to this blog, but I got MegaMan Zero Collection yesterday. And it was awesome. I'd recommend people read all of Scanlated Getter Robo to completely appreciate the vague similarities between the two franchises. Ok, I find it offense. I know I'm seven years late, but does anyone have an active link to this?